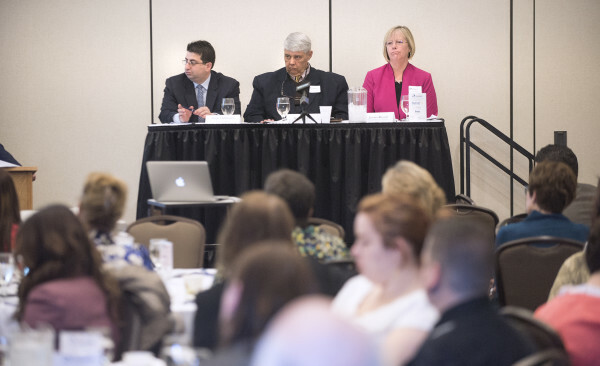 Maine Career Connect and Maine State Chamber hosted a workforce development summit Wednesday at the Cross Insurance Center in Bangor. Pictured are from left, Peter DelGreco, Michael Aube and Joanna Russel. 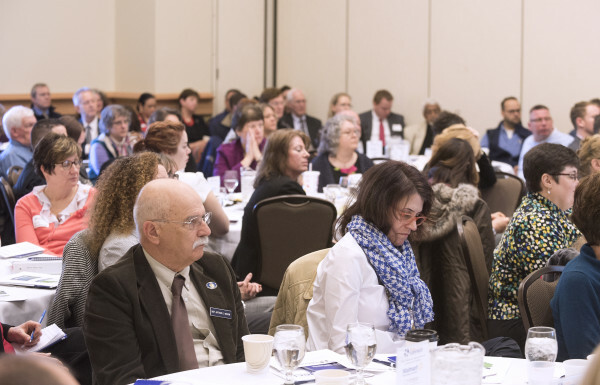 Maine Career Connect and Maine State Chamber hosted a workforce development summit Wednesday at the Cross Insurance Center in Bangor. BANGOR, Maine — Maine faces huge challenges in coming years if it wants to reverse the trends of shrinking numbers of workers and an aging population. More than 100 representatives of Bangor-area businesses, economic development groups, schools, state agencies and politicians crowded into a small meeting room at the Cross Insurance Center Wednesday to address those challenges during the Maine Career Connect Workforce Development Summit. Since then, the workforce has been on the decline as the state’s population aged. In 30 months between 2013 and the start of 2016, Maine lost 5 percent of its workforce. “That’s a lot to lose in 30 months,” Connors said. To turn it around, the state needs to attract more families and convince students who earn degrees in Maine to stay here to start their careers and families. This isn’t just a Maine issue, it’s a national problem, according to Peter DelGreco of Maine & Co., a Portland-based business consulting firm. Other states and large cities have been grappling with population challenges of their own, and the Bangor region and Maine as a whole could find solutions through their examples. DelGreco cited Detroit, which has launched a campaign to attract “hipsters from Brooklyn.” Chicago has launched a “bicoastal” campaign to try to bring back people who left the city to live on the Atlantic or Pacific coasts. New Orleans is trying to bring back residents who fled in the wake of Hurricane Katrina. DelGreco argued Maine has a distinct advantage in its efforts to address workforce changes — because the state is small, it can be “nimble,” and seemingly small efforts and programs can have dramatic effects on reversing the trend. “We’ve got to look at other examples,” DelGreco argued. 2. Right time, right place. Part of the reason the workforce group gathered in one of the Cross Center’s smaller meeting rooms was that the bulk of convention spaces were occupied by about 500 University of Maine graduate and undergraduate students. The university hosted its 2016 Student Research Symposium on Wednesday, and it wasn’t a mistake that the two events were going on at the same time at the same venue. When organizers of the summit and the university symposium learned they were looking at some of the same potential dates, they decided it made sense to host their respective events at the same time, according to Samuel Belknap, a graduate research fellow at UMaine. Carol Kim, vice president for research at the University of Maine, encouraged attendees of the workforce symposium to journey next door after the event to get a glimpse of the projects students were showing off. Their research focused on issues ranging from bee pollination and aquaculture to psychiatry and acoustics. “Our future employees are right next door,” said Deb Neuman, head of the Bangor Region Chamber of Commerce. Mike Aube, president of Eastern Maine Development Corp., pointed out that the Penobscot region has lost 1,700 jobs in the paper industry, forcing communities to rethink the basis of their economies. It’s unlikely the workforce in those industries will rebound to the same level, he said, so it’s time to look into what types of work could replace those jobs. He says many could come from smaller employers related to STEM (science, technology, engineering and math) fields. “Small is the new big,” Aube said. Aube said there are 20,000 higher education students within 45 miles of Bangor, including the roughly 500 in the room next door. “How do we keep them in this region? How do you retain them with jobs that are good paying?” he asked.